Tulum was the site of a Mayan port on the Yucatan Peninsula in Mexico. It's set against a tropical beach in a beautiful setting. Today, Tulum has become a popular tourist destination on the Caribbean Sea. The area can get quite crowded, particularly around the archaeological site. It's best to stay at least one night in town so you can visit the ruins first thing in the morning before the crowds arrive. There are some nice budget friendly places to stay around the town. Many hostels and hotels take advantage of the Caribbean setting and have nice gardens with hammocks and barbecues. They usually provide a relaxing oasis where you can escape the crowds. 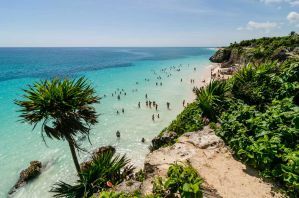 How much do hostels in Tulum cost? Mama's Home is a centrally located hostel in Tulum, Mexico that is a great place to hang out and make some new friends. The hostel is located just three blocks from the bus station and it's surrounded by many restaurants and bars. Despite being in such a convenient location, it still sits on a quiet street where you can enjoy a peaceful setting after a busy day out on the town. The hostel is designed with travelers in mind. There's a nice patio where many guests enjoy relaxing. There are also several common areas and a fun atmosphere that will quickly have you feeling like part of the family. The hostel includes a variety of benefits to guests including a great breakfast that is served every morning on the terrace. It's the best way to start your morning in the lovely Caribbean. The hostel has simple, six bed dorms for travelers who are on a tight budget. If you're more interested in having a little privacy, there are twin and quad private rooms available as well. Each room has it's own attached bathroom. El Jardin de Frida is a unique place to stay in Tulum. The hostel focuses on the ecology and culture in the area. At the heart of the hostel is the beautiful botanical garden. This is a wonderful place to soak up the sun and enjoy your Caribbean setting. The hostel is located in a residential part of Tulum, about five minutes from downtown and the bus station. If you're looking for a peaceful little oasis where you can relax and soak up the tropical setting, then this is the place to stay. The hostel has a lot of character and the rooms make use of the Mexican culture. Private rooms are large and many have a balcony that looks out on the garden. There are also suites available that have separate bedrooms and their own kitchen as well as a small living room and a private terrace. Dorms are more simple and affordable, with bunk beds and bathrooms attached. This hostel is surrounded by nature, and it will become a refreshing retreat for you during your time in Tulum. There's also an on-site bar where you can enjoy a cold drink. Guests can also enjoy a library, hammock area, and a shared kitchen. Daytripper Hostel is another popular option in Tulum. It's about a kilometer from the town center and is about a seven minute drive from the beach. It's also less than a kilometer from the bus station and is a short drive or long walk from Tulum Archaeological Site. It's near convenience stores, restaurants, and a bank. The hostel is clean and welcoming. There are several common areas where guests enjoy relaxing as well as two nice terraces and a rooftoop lounge that has comfortable hammocks where you can lounge. The hostel has eight bed dorms that are affordable and basic. This is a good option if you want affordability and comfort, but nothing too fancy. Chill Inn Hostel is another fun option. They offer unique Palapa style huts that really transport you back in time. It's a neat environment where you can relax after a busy day exploring the area. There are four dorms available that sleep either four, eight or ten people. Beds have privacy curtains and reading lights so you have a little personal space. The hostel also has a shared kitchen where guests can prepare their own meals. There are common areas both indoors and outdoors and many guests enjoy hanging out and swapping travel stories. The hostel also provides guests with a filling breakfast and wi-fi throughout the grounds.